Guitars are sensitive instruments and require attention and care. Acoustic guitars are very delicate since they are essentially hollow wooden boxes. Although this may seem obvious, it has be to said: never drop your guitar or bang it around! Electric guitars are a lot sturdier, but even they require care. The worst enemy of a guitar is humidity. The strings on a guitar are putting constant stress on both the neck and the body (where the bridge is attached). Excessive humidity (summertime or rainy weather) will swell the wood and cause bowing. Insufficient humidity (winter or desert dryness) will dry out the wood and crack the glue that holds the seams together. The ideal level for any guitar is 50% humidity. In areas where extreme changes to humidity occur, it is recommended that the guitar be kept in a hard case (which has packing shaped to the guitar size) to reduce the amount of air exposure. Otherwise, a humidifier/de-humidifier should be used in the guitar room to maintain a consistent humidity level. Once humidity is being monitored or controlled, the best place for a guitar that used often is on a guitar stand. A stand will support the guitar properly by its neck and body, preventing uneven pressure (under its own weight) from causing the wood to bow. 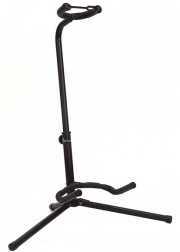 A guitar on a stand looks way cool too, and its easy to just grab it and play whenever you get the urge. A word of caution on electric guitars on stands - NEVER leave the amp turned on when the guitar is on a stand next to it. Sound (even if its inaudible to you) from the amp causes the strings to vibrate, which in turn causes the pickups to send a signal to the amp, which again sends more sound to the strings (a feedback loop). Eventually both your amp and guitar will be fried. For high end guitars that are NOT used often (especially when you have many guitars), the best place for it is in a hard case. Cheap guitars may cost less than the price of a hard case, so it would not really be worthwhile. Note that for long term storage of guitars, you should loosen the strings and store it in a hard case - if the wood expands the tension of the strings would cause the neck to bow, or would pull the saddle out of the body. You should clean your guitar each time after you play it. The oils and sweat from your hands get deposited onto the strings and wood, causing corrosion of the strings and damage to the glossy finish on the wood. A soft cloth should be used to wipe down the wood (neck and body), and an alchohol swab can be used to wipe the strings (do NOT get the alchohol on the body!). Guitar stores sell special cloth and wipes for this purpose, it is best to get a suitable product that you know will work well on your guitar. This may seem obvious, but: NEVER wash your guitar! You will eventually have to change the strings on your guitar(s). The life of strings depends on how much you play and how you play. Whenever you hear the sound of your guitar starting to go dull, or if it constantly goes out of tune, you may need new strings. 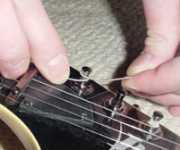 Always change all the strings at the same time - an exception could be if you break one string soon after a string change, then change only that string. When you are changing all the strings, you have the opportunity to do some more cleaning and maintenance. You CAN remove all the strings at one time - but you must get the new strings back on promptly (don't put it off for another day). If your acoustic-electric guitar has an active pickup that uses batteries that fit through the soundhole, change the battery while you have the strings off. But mainly you have the opportunity to clean the fretboard - use a damp paper towel folded flat and gently wipe the frets and the fretboard between the frets. Do NOT drip any water on the fretboard, just a slightly damn paper towel is all that is needed. Immediately wipe it off with a dry paper towel, ensuring no water is left anywhere. All guitars will need adjustments and/or repairs at some point in their lives. Electric guitars need to have their intonation adjusted frequently, most have a simple screw to set this and you may be able to figure it out from the guitar owners manual and using a tuner. For more complex repairs and adjustments, it is strongly recommended that you take it to a professional guitar repair shop. Neck adjustments are tricky things to accomplish, as are adjustments to the saddle, bridge or string action. To return to the home page click here for Guitar Info. To read the next page, click the link marked Next>>> below. Content and materials on this website are Copyright ©2006-2019 AcousticGuitarElectricGuitarLessons.com. Access to this website and content is provided with no guarantees, and we are not liable for any damages, consequential or inconsequential, from the ability or disability of using this website. Use these materials at your own risk. Usage of this website constitutes acknowledgment of these disclaimers and terms. View our Privacy Statement.